MPDS4 version 6.2 includes new functionality for improved reporting and a simpler user experience. The optimisation of interfaces simplifies data exchange with customers and suppliers. The main focus of version 6.2 is to achieve a simpler user experience through improved functionality, and faster design by expanding the range of catalogues supplied. Several new catalogues for pipeline design are provided in the new version. Catalogue components can now be modified prior to placement, and cutting allowances can be applied to individual pipes. Thanks to improvements in the production of 2D drawings and parts lists, the creation and update of both construction and end-user documentation is now even quicker. Another focal point of MPDS4 version 6.2 is to improve interoperability with third-party systems. The system’s 3D interfaces were optimised to improve data manageability and simplification when importing large 3D models. The sharing of 3D data with customers is also a lot easier in version 6.2. For example, a new 3D PDF export capability was added to MPDS4, and MPDS4 REVIEW now features enhanced viewing functionality. 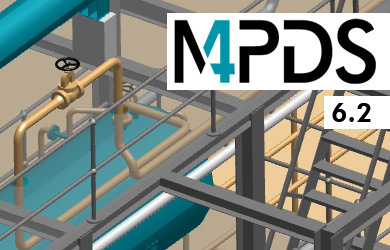 The MPDS4 plant design and factory layout software can be downloaded from the CAD Schroer website for a free 30-day trial. Video tutorials are available to help you get started and CAD Schroer also offers free support throughout the test phase.